Catch up with Andrea and Jack’s Learn to Swim adventure in Andrea’s latest parent blog. In this blog, Andrea talks about Jack’s enthusiasm for water and why she tries to pay attention throughout the whole of Jack’s swimming lessons. Jack’s ability to concentrate is second to none. He can zone in and tune out any and all distractions and interruptions. However, this is only if it is something that he wants to be doing. Generally anything I need or want him to do is an annoying interruption. Now, Jack loves the water. He likes jumping in and splashing about. His energy when he is in the water is almost palpable. 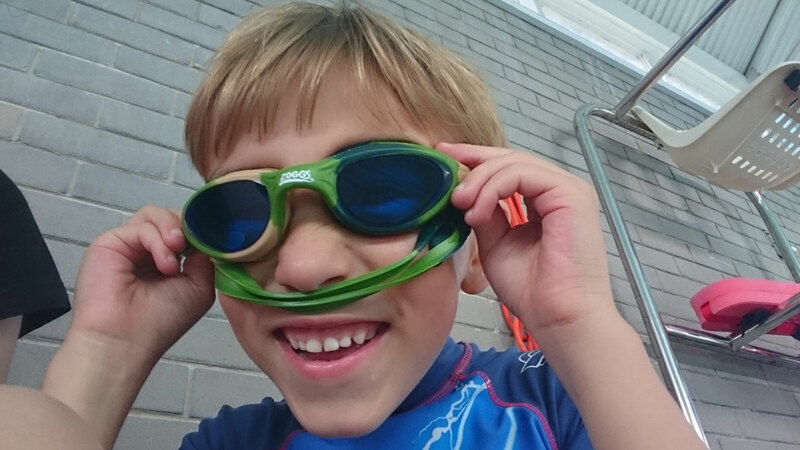 When he gets in the water for his swimming lesson, he quickly dunks himself under, then bobs back up, then the head goes under again because the sheer excellence of goggles and their ability to let you see under water still hasn’t worn off. He spins around. He treads water. He is, in many respects, a lifeguard’s nightmare. His antics resemble someone who is in trouble in the water and his poor teacher does have to tell him a few times (okay, a lot of times) every lesson to hold onto the side. This isn’t something I want to discipline out of him. I don’t want to curb his enthusiasm or crush his spirit in the name of good behaviour. The only thing that seems to keep him vaguely on track is his overwhelming need to be the fastest at getting from A to B. In this case, from one side of the pool to the other. They tend to set the children off one or two at a time, sometimes in a staggered start fashion. This helps because if he goes after another child, he has them in his sights which keeps him still and focused. When he pushes off he is like a rocket – sometimes a slightly unruly rocket, but a rocket nonetheless. When he finishes, he looks over to me and we get a tiny fist pump and an elbow dig with a “yessss!”. What I have found is that by him knowing I am watching, he wants to do well and ‘win’ with me watching. I try my best at Jack’s swimming lessons to pay attention, 100 per cent for the 30 minutes he is in the pool. I use it as the one time I can sit back and enjoy watching how he behaves in a group (or sometimes doesn’t! ), how he interprets the day’s lesson, how much he enjoys it. I use Jack’s swimming lesson as a time I can fully check in with him. There are no distractions. I can see when he does well, I can see when he does less well, I can see when the teacher has to tell him to hold onto the side for the millionth time, and I’m there when he looks up to make sure I’ve seen him do well. The saddest thing I find – bear with me on this slightly controversial note – is when parents use it as time to check out. Some use it as a time to write work emails or catch up with friends on social media. They’re engrossed in something on their phone because someone else is looking after their child. Let me assure you I’m not a perfect parent who is engaged with their child at all times. I’m like almost every parent I know – unsure they’re doing the right thing, overrun with things to do and dealing with the mild anxiety over decisions you make for your child every day (top of the list at the moment: how much screen time is too much?!). I’m not judging, but I do find it sad to see the downcast faces of children who look up from their swimming lesson after their latest feat in the pool, only to be disappointed to see the top of their allocated grown-up’s head rather than a smile and a thumbs up. I know it’s hard and that any possible downtime is a welcome break, but I find a small dose of focused attention reaps massive rewards in the long run. Jack’s swimming lessons give us the perfect opportunity and are a weekly reminder to pay attention to him, to enjoy him learning and achieving and to share in his joy at doing it. Don’t get me wrong. It’s not all sunshine, lollipops and rainbows every week. We have meltdowns, upsets and grumps as any parent and child combo does. But if I am telling Jack that he needs to be better at paying attention, maybe I owe it to him to practise what I preach?